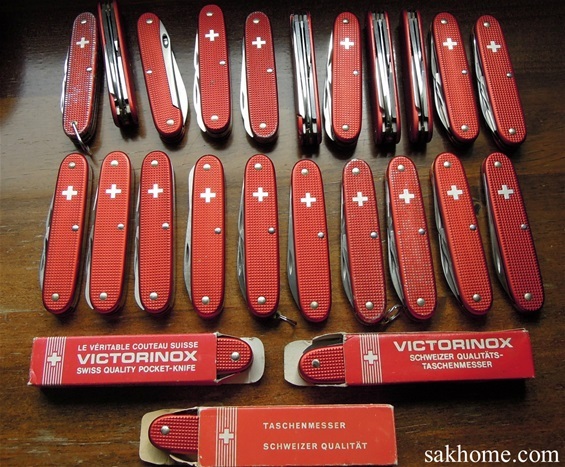 Here are some red alox 93mm Victorinox knives. Most already know the old Alox history with stampings and modifications. Most of the knives on the picture are in very good condition. 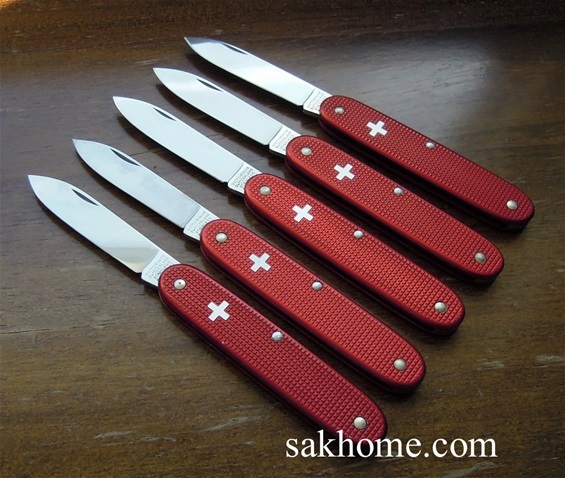 The red Alox is very popular with collectors and they are desirable. I find it very interesting to research all the stampings, variations and models made in history. 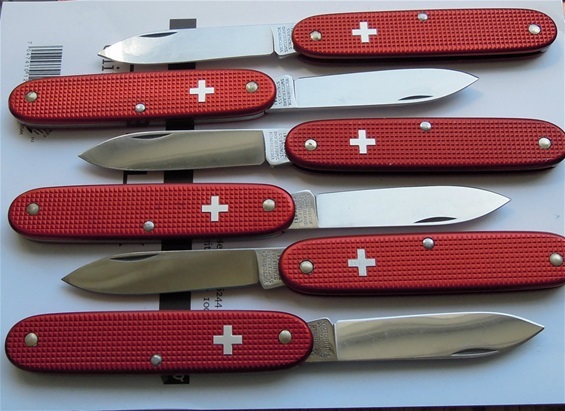 From 1957 until today they represent a milestone in versatile Swiss knives and knives of the world. 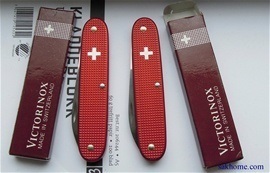 The red Alox is known to be some of the most durable products made by Victorinox ever and they are or have not gone out of date. The tools and functions fit just as good today! For collectors there are many interesting details, production variations and tool evolution to look for. Like you know the old red cross ended in approximately 1999. 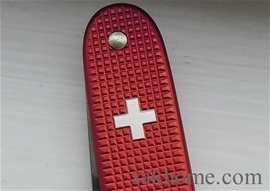 You also know that the handles are made of aluminum that is anodized and colored. The detail work on the cross itself is interesting because it can vary because of the production development and more. On some of the old cross emblem the detail work with the coloring are so well done that it gives a better impression of the emblem. So this is a detail I recommend to look for because it can be interesting. On the below picture are some old cross emblems in random order. I recommend to integrate this into the history and dating knives. The brass liners/dividers are very durable and solid in this construction. The brass may or can develop some patina like on this old knife from the early 1960s. This is not negative at all! It will not represent a surface development that is a build-up. So no problem at all. I like it very much. If you use a old Alox knife and put some oil on the friction parts the oil some of the patina may fade away. 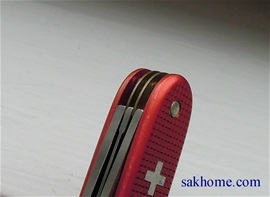 Here are two interesting red Alox knives with the old cross emblem. They are in the same type of box. 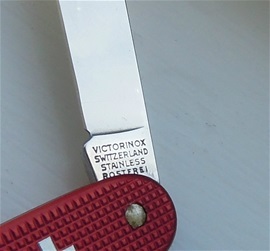 The one on the right got the large V in the Victorinox stamp. The v change happened around 1986-1987. It is difficult to date these even with a box but i would believe the left knife is from the mid 1980s because of the small v. I do also have a suspicion that this stamp may have been used at different times and the dates may vary more. One should be careful to be too bombasting with the usual dates. It is always more easy to date a knife with more functions. What is interesting also is that this knife(left) got the best details on the cross. It is possible to integrate the cross variation into dating knives and it is difficult but it can be done then keep that in mind. One can involve production variations too. The right knife with the large V i would believe are after 1987 and could be early 1990s. If you have further information on the type of box and dates then please let me know. If you are in doubt that the knife may have been switched in the boxes then try to verify with others. That was exactly what i did some time ago with the Solo knives. I can confirm that there are other knives with the small v in the same type of box. Here are some Solo Alox knives in random order. Some are from different dates even with the same stamp but there are differences in the stamp even if they look the same. The color on them vary as well. Here we have production variations and different dates + more. Just these Solo Alox knives could tell a whole story!